Come join us in the virtual world of Zwift at 6:15 for a 90 minute group ride targeting an endurance pace (2.0-2.5 w/kg). The loop features the climb up New York’s KOM Climb where we will open things up and race the climb then regroup at the bottom of the descent. The first and last 10 minutes of the ride will stay in around 1.5w/kg effort to warm up and cool down. 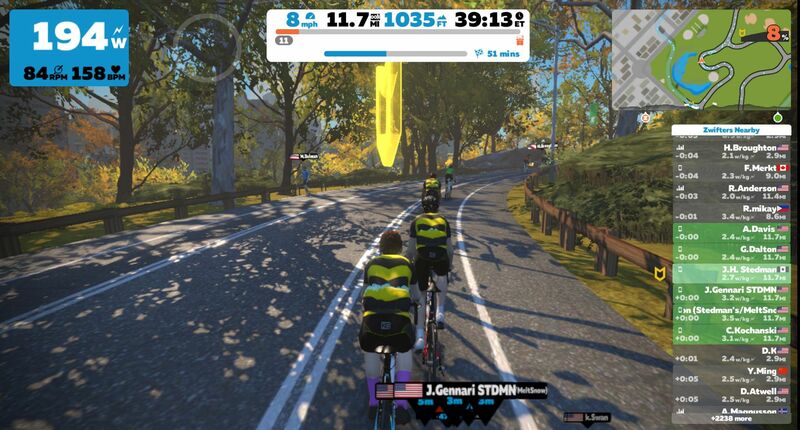 In order to join the Meetup you need to be following “Jimmi H. Stedman” on Zwift. Tonight’s ride is featuring the Knickerbocker route in Watopia. You are welcome to join us from home or bring your trainer and Zwift device to join us in the shop. A demo trainer is available in the shop by reservation. Howdy Folks, I’m guest hosting the Zwift ride tonight, come join me in the virtual world of Zwift at 6:15 sharp for a 90 minute group ride targeting an endurance pace (2.3-2.7 w/kg). This week we’ll be doing the London Loop (14.9k w/ 220m of elevation per lap), featuring the Fox Hill climb. We’ll take it easy for the first 6k then bump it up to our target effort. Those who want to climb the hill hard are free to do so, we’ll regroup at the base of the short kicker hill about 1k after the Fox Hill KOM banner. In order to join the Meetup you need to be following: “Joel Brown [Stedman’s/MeltSnow]” on Zwift. Please switch your kit to the black and yellow bumblebee jersey named “basic 1” to help identify the folks in the group. If you have any questions, send me an email at: joel@westedman.com or shoot me a text at 401-742-5604.